One of the best examples of Central Park's rich endowment of exposed bedrock, Umpire Rock is likely named for its commanding view of nearby baseball diamonds. Central Park has an unusually rich endowment of exposed, ancient bedrock — rocks that are not only highly decorative, but also contain visible evidence of epochal events dating back hundreds of millions of years... 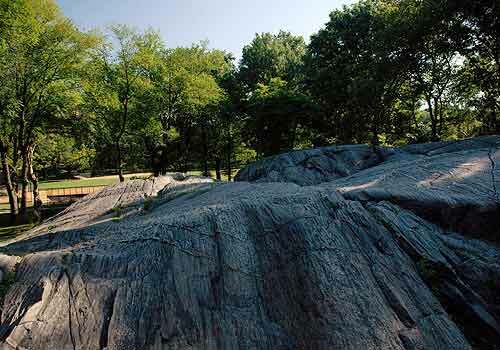 Lying between Heckcher Playground and Heckscher Ballfields, Umpire Rock gets its name for the commanding view visitors get of the baseball field from atop the mound of, mica-flecked stone that comprises 90 percent of the bedrock under Manhattan. The schist was formed from sedimentary shale by intense subterranean heat and pressure some 450 million years ago in the Paleozoic Era. While the schist of Umpire Rock was being formed, it was twisted and folded by upheavals in the earth's depths. Minerals scattered in the former shale were fused into crystals of quartz, mica, feldspar and garnet within the schist. Lighter-colored veins of granite and coarser granite pegmatite are visible across the grain. These inlays were actually once liquefied rock from the earth's interior before they were injected into fissures in the schist and cooled into bands of solid rock. West Side at 63rd Street just south of the Hecksher Ballfields.